Arranged marriages are still very common in India, and in the case of Christian marriages the Pastor often acts as a “marriage broker” between the families. 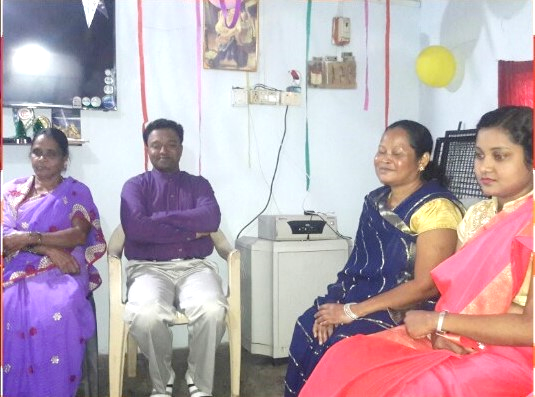 Pastor Pani has sent details and pictures of one such gathering of two families. The young people whose possible marriage they were discussing may not have been present at this meeting, and they almost certainly would never have been together alone, without chaperones. It is possible that at this stage of the process they had never met! “This is a marriage proposal meeting. The boy’s side’s family has reached to girl’s side’s family to give marriages proposal here. We are talking about both side’s opinions regarding this marriage proposal issue. By God’s grace, eventually both families agreed to accept this marriage proposal meeting. Most probably they will be doing the marriage negotiation meeting by next month – in March, as both families have discussed today. The boy side’s family is coming from our Jharsuguda Mission field and the girl side’s family is from our Brajarajnagar Mission field. Please pray for the success of this marriage proposal meet and for the marriage negotiation ceremony in March.